A new report from the Center for American Progress (CAP) estimates the societal benefit in reduced crime and improved public safety of expanding the EITC for workers without dependent children. The report notes that access to adequately paying jobs and the ability to make ends meet are key to successful reentry, a reduction in recidivism, and the prevention of new crime. Using a similar methodology to a recent paper from the White House Council of Economic Advisers that calculated the anti-crime impact of raising the minimum wage, CAP estimates that EITC expansion would generate an additional $1.7 billion to $3.3 billion in societal benefit from crime reduction and increased public safety. 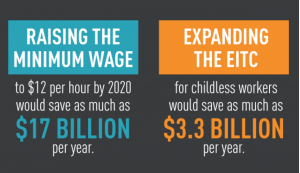 See also CAP’s related infographic: How Could Boosting Wages Reduce Crime?